All United States Mint products with American Silver Eagles and commemorative coins will be available for just a few more hours. The U.S. Mint will stop selling them today at noon ET. Several older annual sets will also go off sale tomorrow at 3:00 p.m. ET. Two of them are sitting at sales lows that have not been seen since the 1950s and ’60s. The latest sales stats don’t show a serious last minute run for any of them, at least through Sunday. Although on Tuesday, the 2015 $5 Proof U.S. Marshals Service Commemorative Gold Coin unexpectedly joined the ranks of the unavailable. Order the above products from the U.S. Mint’s website right here. Their most recent weekly sales gains are in bold in the larger table further below. In the last chance products, collectors may want to look closer at the two core annual sets from 2014. The 2014 Proof Set with sales of 713,210 is poised to finish with lowest total since the 1956 Proof Set ended at 669,384. The 14-coin 2014 Proof Set is available for $31.95. Similarly, the 2014 Mint Set at 345,188 marks the lowest level since the 1961 Mint Set logged sales of 223,704. 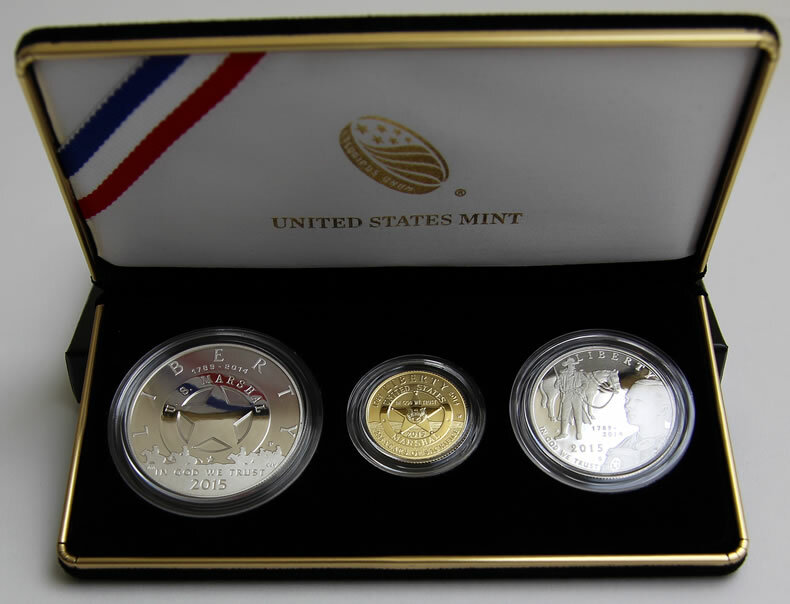 The 28-coin 2014 Mint Set is available for $27.95. The U.S. Mint published sales updates to 253 numismatic products. Ninety-one of them outperformed their prior weekly sales compared to 31 previously. Eight of them increased by more than 1,000 units compared to 6 previously. Eight had their sales reduced compared to 11 previously. The 2015-W $100 American Liberty Gold Coin added 242 to 48,604. The 2015-W $50 Uncirculated American Gold Eagle declined 4 to 6,486. The 2015-P Saratoga Five Ounce Silver Uncirculated Coin declined 15 to 17,794 (back on sale). The 2015-W Proof American Platinum Eagle declined 4 to 3,886. The 2015 Kennedy $1 Coin & First Spouse Medal Set added 2 to 24,183. The 2015 American $1 Coin & Currency Set declined 24 to 88,273. The 2015-W $50 Proof American Buffalo Gold Coin added 2 to 16,561. The 2015-P Blue Ridge Parkway Five Ounce Silver Uncirculated Coin was unchanged at 17,462. Below are tables showing the latest sales for U.S. Mint numismatic products. The sales period covers Dec. 21 to 27. Products with an asterisk (*) are no longer available. Thank you very much, Mike, for these updates. I am a little surprised that the Kennedy silver half set just keeps plodding along. Thought it would have sold out sooner, though it seems to be getting close to a sellout now. It will apparently be of the last silver items still on sale after tomorrow. In regards to low mintage coins, as of last Sunday December 27, 2015, the 2015-W U.S. Marshals Commemorative $5 Uncirculated Gold Coin has a low mintage of 6,674. By comparison the 2001-W Capitol Visitor Center $5 Uncirculated Gold Coin has a low mintage of 6,761. The 2013-P 5-Star Generals $5 Uncirculated Gold Coin has a low mintage of 5,667. The 1997-W Jackie Robinson $5 Uncirculated Gold Coin has the lowest mintage of 5,174. The 2015-W Proof Gold Buffalo has the lowest mintage in the series @ 16,561. The 2015-W Proof Platinum Eagle has the lowest mintage in the series @ 3,886. The 2015-D U.S. Marshals Commemorative Uncirculated Clad Half Dollar has a low mintage of 29,819. The 2015-P March of Dimes Uncirculated Silver Dollar has a low mintage of 24,632. Nothing beats the first spouse series for low numbers, some not even cracking 2k. But who cares, right? Other mints have coins that they routinely only make up a few hundred, some as few as 10. So low mintage is the new normal one must assume. Totally agree. The Mint got too greedy especially with the 4 coin silver set still on sale over a year later… and I think in 2015 they only sold about 29k. They should have declared it as sold out and shut it down like the clad counterpart. I’m so glad I only got the silver set and that was just to keep my RP and EU collection intact. Nice low mintage of 222,218 for the 2015 Uncirculated Silver Eagle. That’s including the 2015 Annual Uncirculated Dollar Coin Set. One of the lowest years with the old design. 2014 Proof sets should end up with a lower mintage than the sought after 2012’s. The uncirculated mint sets should be even lower than the 2013’s! The more information we get the better it is for us to make picks of the right graded coins to go after. And by the way….are there any pictures or images of the new Silver Eagles? Did the 14 coin 2014 Proof Set end up with the lowest mintage since the 1956 set?